Reducing a folk melody to its pitch spectrum does not fully elucidate its development, and few participants in an oral tradition consciously follow scalar dicta. Nonetheless, an awareness of the tonal material of a folksong is essential to the broader understanding of the idiom that that song represents. Much confusion has arisen from the varied ideas concerning the anhemitonic1-pentatonic basis of most British-American2 folksongs. What now is needed is an approach that is basically simple yet capable of accounting for the often complex tonal character of the tunes. The offering of such a solution here is preceded by a short summary of select earlier views. Figure 1. The five pentatonic scales of Scottish folksong, according to Gilchrist. The regular members of the scales are shown as white notes, while auxiliaries are shown in black. Gilchrist also noted that several heptatonic modes could be formed by the insertion of auxiliary tones into the minor thirds of the pentatonic scales (Figure 1, above). The tone that Gilchrist designated b-flat was fixed, while e was variable.4 In her Mode 3, the downward inflection of e would throw an Ionian melody into the Mixolydian mode. Conversely, a Mixolydian tune could contain one or more Ionian leading tones (Figures 2 and 3). Figure 2. Table of pentatonic and heptatonic modal equivalencies, after Gilchrist. Figure 3. Formation of either the Mixolydian mode or the Ionian mode through inflection or non-inflection of the auxiliary e in Mode 3. Figure 4. The pentatonic series of Sharp and Gilchrist, with auxiliary notes. Figure 5. The gamut used by Foss, with its tones numbered after Bartók. Figure 6. 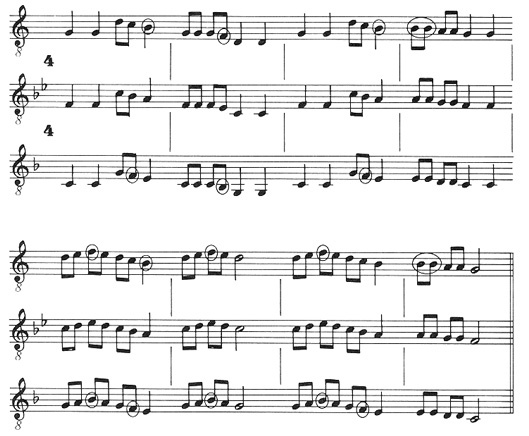 Foss's encoding of a folksong scale with chromatic alterations. Figure 7. A scale common to two groups, adapted from Foss's scalar table. Figure 8. Foss's classification of the tetratonic scale g-b-d-e-g' in terms of its relationships to three pentatonic headers. Figure 9. The Bronson mode-star. Figure 10. Application of Cazden's theory of the subtonic juncture. The present theory of southern uplands scales draws upon the views summarized above, but much older ideas are taken into account as well. Despite archaic regional terminology, the information in surviving documents points toward the existence of a sophisticated, codified, and probably pentatonic scalar system in Britain by the close of the Middle Ages. Part of this system continued to govern indigenous practices until modern times. From these practices and the written material we can reconstruct what once may have existed. There are five established and warranted keys; and out of those may be formed other keys at pleasure. One finger of a Crythor [crwth-, or lyre-, player] . . . keeps three keys; namely the lower key, the sharp key and the flat key; and this is the long finger. The fore finger keeps the intermediate key and the mixt key; these are the five principal keys. . . .
Flat key (lledyf gywair) reappears, in a hand other than Morris's, on manuscript page 108, as a label for a harp scale. Like the others on the page, this scale is written in letter notation and is paralleled by a companion scale that now is thought to be a scordatura. Figure 1123 shows the flat key (white notes) and its pentatonic equivalent (black notes). Figure 11. Lledyf gywair and its scordatura. 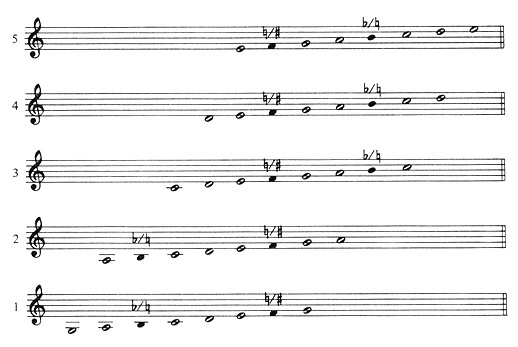 The scordatura of lledyf gywair corresponds intervallically to Gilchrist and Sharp's Mode 1, except for the auxiliary seventh above the keynote (Figure 12). Figure 12. The pentatonic equivalent of lledyf gywair, with Gilchrist and Sharp's Mode 1. Thus a connection is established between a modern folksong scale and a seventeenth-century one, and the latter was nominally associated with a scale that may have been in use by ca. 1400. Gilchrist and Sharp's observation of five pentatonic scales lends a measure of strength to this somewhat tenuous link between the most recent and earliest-known Celtic scales (the "five established and warranted keys"). In light of what is found in MS Robert ap Huw, it might be wise to think of British-American folksong scales in pentatonic rather than heptatonic terms. This dispenses with the idea of missing heptatonic degrees in favor of one that views these notes as additions to the pentatonic series. Figure 13 shows the modes of Gilchrist and Sharp, with Mode 1 beginning on g, in conformity to the practice established by Bartók. Figure 13. Transposition of the complete series of Gilchrist and Sharp, with Mode 1 beginning on g.
The scales are offset to show their interrelationships through successive inversions. Figure 14 is a condensation of the pentatonic series into a gamut comprising five overlapping, interlocking segments. Figure 14. Figure 13 condensed into a gamut. Figure 1524 shows the gamut extended to encompass the maximum range of all melodies combined. Figure 15. The pentatonic series with its variable auxiliaries (black notes) and numerical pitch codes. 1) The regular members of the gamut are numbered 0 through 4, for g, a, c, d, and e, respectively. 3) These pitch-class codes occupy the units' place in the complete three-digit label. 4) An unaltered tone is indicated by a zero in the tens' place of the label. A 1, in the tens' place indicates a sharp, while a 2 denotes a flat. 5) Pitches in the central octave of the gamut (g through ') are indicated by a zero in the hundreds' column. 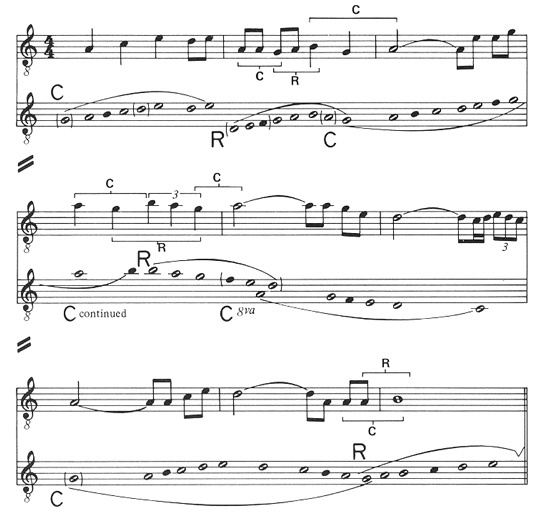 Higher notes are shown by a 1 in that column, and lower notes are numbered in the 200s. For instance, the complete code of g is 000, that of g' is 100, and that of G is 200. This coding was developed to expedite both the manual and the mechanical processing of data in tune-analysis and -comparison. Therefore pitch codes are entered into textfiles, on floppy disks, in their shortest forms. For example, c' is filed as 2, not 002, and ' is filed as 16, not 016. In each of these cases, the complete label would occupy more than the necessary amount of filing space, since the computer ignores prefatory zeroes when it converts a decimal value to a binary one. The complete code was found to be beneficial in certain manual operations, and for this reason it does appear on written data sheets. 3) the locations of the auxiliary tones within the transposed tune. The melody is best transposed so that most (or, ideally, all) auxiliaries occur either on weak beats or on afterbeats—and are not essential to the definition of the tune's tonality. Pentatonic melodies with major tonality are aligned with the c-segment of the gamut, and c usually functions as the keynote (Figure 16).27 The g-segment is not used for Mixolydian tunes because it lacks the distinguishing major third above g unless the auxiliary b is used. Figure 16. Transposition of a "Barbara Allen" tune to its proper level in the common pentatonic gamut. Asterisks denote minor thirds that determine the alignment. Minor-pentatonic melodies are aligned with the a-segment, and a is the usual keynote. The d- and e-segments are not used for Dorian and Phrygian melodies. Without the auxiliary f, the d-segment lacks the characteristic minor third above the normal tonic. If the auxiliary b is not used, the e-segment lacks the fifth above the key-note, and this degree is rarely absent from folk melodies. 1) Auxiliary notes should not be used as major or minor thirds above key-notes, and they should not sound on strong beats. The transposition of the familiar melody of "Old Joe Clark" (Figure 17) illustrates the relocation of a non-pentatonic, tonally major melody. Figure 17. "Old Joe Clark" (middle staves), transposed incorrectly (upper staves) and correctly (lower staves). The auxiliary notes are circled. Both the range of the tune and the Mixolydian seventh might first suggest g as the keynote, but this would involve the occurrence of the auxiliary b on the strong initial beats of measures in two instances (measures 4 and 8, upper staves). Also, the use of b as the major third above g is improper. 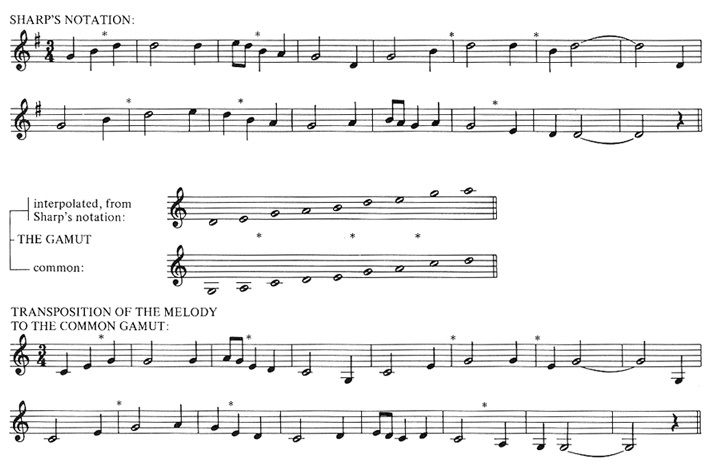 Beginning and ending the melody on c establishes a regular gamut member (e) as the major third above the keynote. The use of b-flat as the Mixolydian seventh is permitted under Condition 2. Finally, all auxiliaries meet Condition 1 if the tune is aligned with the c-segment. Occasionally both the original keynote (and hence the transposed one) and the tonality are unclear. In Figure 18,29 for example, the original keynote could be either f (= c in the common gamut) or d (= a); and the tonality is frequently ambiguous, most notably at the final cadence. Figure 18. Hymn-tune, "The Hebrew Children." Figure 19. Transposition of "The Hebrew Children" to the common gamut on the basis of minor-third location. It should be stressed that the present theory does not discount the normal prominence of one tone over the others in a tune. Keynote ambiguity is the exception rather than the rule, yet it happens often enough that keynote-assignment in this procedure is not a strict declaration of tonic or scalar alliance. The proper alignment of the intervals (especially the minor thirds) of the tune with those of the entire gamut is more important than determining the keynote. One other trait of pentatonic folktune behavior needs to be pointed out. This is the gamut-shift, or the relocation of the gamut at a different tonal level, usually around a short series of adjacent notes that are common to both levels. "Black is the Color of My True Love's Hair" (Figure 20) immediately reveals its ties to the second segment of the common gamut, yet the prominence of the auxiliary b throughout the tune (bracketed and circled notes) is difficult to explain according to new theory presented thus far. Figure 20. "Black is the Color of My True Love's Hair," with brackets under the motifs using the auxiliary b (circled). What seems to be taking place is the intermittent crystallization of the gamut around the series g-a-b, which can be extended to form the scale g-a-b-d-e. This equivalent of the third common-gamut segment, c-d-e-g-a, is the basis of the relocated gamut, of which b is a regular member instead of an auxiliary (Figure 21). Figure 21. Shifting of the common gamut (C) to another level (R: relocated). Figure 22. The return of the gamut to its original level (C). and Figure 2331 shows the gamut-shifts in the tune in question. Figure 23. Figure 20, with all gamut-shifts shown. In conclusion, it seems that melodic pentatonicism reached a high level of development in Celtic Britain prior to its supplantation by heptatonic modality. Many folktune traits based upon this pentatonicism have survived until modern times in remote areas. Early outside observers noted the principal traits as they were revealed in songs. Subsequent attempts to account for the many complexities of the system have frequently obscured its fundamentally simple foundation. That foundation is a series of five overlapping octave divisions that form a gamut. Melodies move within the gamut, often but not always with single tones as their centers of melodic gravity. Unlike the heptatonic tonal or modal melody, whose tonic- and final-identities are of great importance, the pentatonic tune is best explained and understood in terms of how its intervals relate to those of the entire gamut. Many folktunes utilize optional, or auxiliary, gamut tones and thus are not wholly pentatonic. However, most of them reflect the influence of this scalar system whose flexibility is as impressive as the tenacity of its main characteristics. 1Anhemitonic: characterized by the presence of no interval smaller than a whole step when only the regular scalar tones are used. 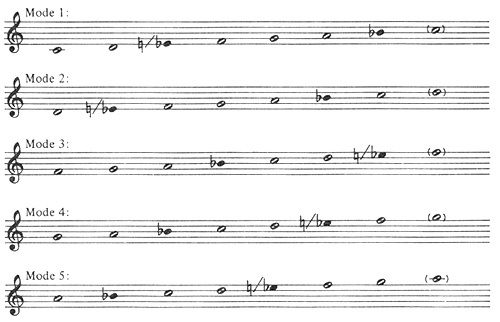 Half steps appear in some melodies that contain additional non-standard, or auxiliary, tones. The temperament of any interval depends upon performer, locale, and other factors. 2In this study, "British" refers to the British Isles in general. Neither "Anglo-American" nor "Celtic-American" is a consistently correct label for southern uplands folksong. Therefore "British-American" will be used whenever a reference to Insular origin is apropos. 3Annie G. Gilchrist, "Notes on the Modal System of Gaelic Tunes," English Folk Dance and Song Society Journal 4 (December, 1911):150-53. 5Olive Campbell and Cecil J. Sharp, English Folk Songs from the Southern Appalachians (London: Putnam, 1917), xv-xviii; Gilchrist, "Gaelic Tunes," 151-53. 6Campbell and Sharp, English Folk Songs, xv-xvi. 7See, for instance, Joseph Yasser, A Theory of Evolving Tonality (New York: American Library of Musicology, 1932), and John Vincent, The Diatonic Modes in Modem Music (Berkeley: University of California Press, 1951). 8Roger Abrahams and George Foss, Anglo-American Folksong Style (Englewood Cliffs: Prentice-Hall, 1968). 9Bela Bartók, Hungarian Folk Music, trans. M.D. Calvacoressi (London: Faber & Faber, 1932). Much of Bartók's methodology was first proposed by Ilmari Krohn, in "Welche ist die beste Methode, um Volks- und volksmässige Lieder nach ihrer melodischen (nicht textlichen) Beschaffenheit lexikalisch zu ordnen?" Sammelbände der Internationalen Musikgesellschaft 4 (1903):640-60. 10Abrahams and Foss, Anglo-American Folksong Style, 211. 12The pentatonic headers correspond intervallically to Gilchrist and Sharp's modes, but Foss begins each of them on g and then arranges them in alphabetical order. 13Abrahams and Foss, Anglo-American Folksong Style, 211. 15Bertrand Harris Bronson, The Ballad as Song (Berkeley: University of California Press, 1969). This volume is a collection of select Bronson studies on the Child Ballads. 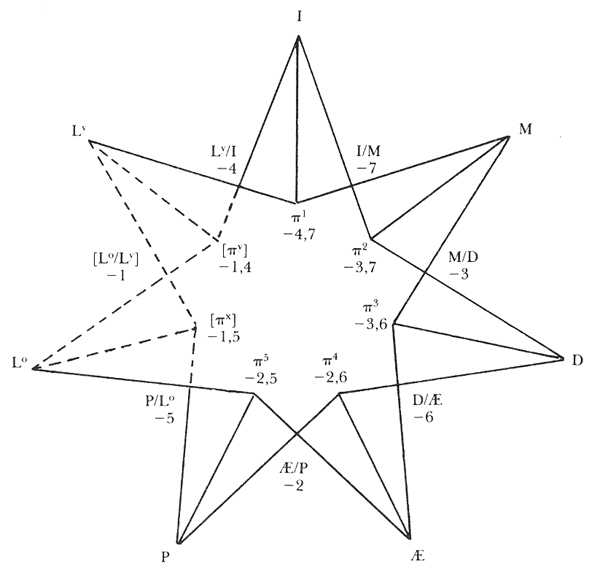 The mode-star appears on p. 85; used by permission. 16For example, the scale c-d-e-f-g-a-(c) is, according to Bronson, a confluence of the Ionian and Mixolydian modes, with the seventh degree (either b or b-flat) missing. This is encoded in Bronson's procedure. 17For example, the first pentatonic scale, π1, is c-d-e-g-a-(c), and it is formed by dropping the fourth and seventh degrees from the Ionian mode. It is encoded . This scale is placed first in Bronson's pentatonic series because of its similarity to the Ionian mode, which Bronson reports to be the most common heptatonic folktune scale. 18I.e., whether the third above the keynote is major or minor. See Norman Cazden, "A Simplified Mode Classification for Traditional Anglo-American Song Tunes," Yearbook of the International Folk Music Council (1971):44-77. 21Also known as MS Robert ap Huw, after its principal owner, this codex contains harp etudes and various annotations dating from the early seventeenth century. It also includes material copied from a sixteenth-century book that had belonged to William Pennlyn, a harpist in the Tudor court. Morris's most significant additions are found on MS pages 3-8. 22"Of the Welsh Music," Cambrian Register (1795), 387-89. This translation was checked, with the assistance of Nansi Richards and Alun Davies (1972), using a printed transcription in Owen Jones, ed., Myvyrian Archaiology [sic] of Wales, 3 vols. (London: Rousseau, 1807), 3:438. There is no support for the claim concerning the origin of the information in the time of Gruffydd ap Cynan. The continuous cultural contact between Ireland and Wales from ca. 1400 suggests this as a more likely date. 23After Owen Jones, Myvyrian Archaiology of Wales, 3:446-47. See also Osian Ellis, "ap Huw, Robert," The New Grove Dictionary of Music and Musicians, 20 volumes, ed. Stanley Sadie (Washington, D.C.: Grove's Dictionaries of Music, 1980), 1:501-2. Ellis kindly communicated his conclusion to me in 1972 while the article on Robert ap Huw was in preparation. 24J. Marshall Bevil, "Centonization and Concordance in the American Southern Uplands Folksong Melody: A Study of the Musical Generative and Transmittive Processes of an Oral Tradition" (Ph.D. diss., North Texas State University, 1984), 82. 25The occurrence of these auxiliary tones provides part of the argument in defense of the evolutionary theories of Sharp and others, and the gloss in MS Robert ap Huw briefly mentions "recess notes" (MS, p. 4). However, if these were the auxiliary gamut members, then all that can be safely concluded is that Insular pentatonicism was being influenced by heptatonic modality at the close of the Middle Ages. There is no evidence to support assumption of either a perceived inferiority of pentatonicism or a process of species betterment through the exclusion of pentatonic tunes. 26In the current procedure, a common gamut is used for all melodies because tune-comparisons are done by computer on a note-by-note basis, and points of intervallic concordance will not be correctly detected unless they share the same pitches. Further, such transposition greatly facilitates the manual aspects of analysis. 27C. Sharp, English Folk Songs from the Southern Appalachians, 2d ed., ed. Maud Karpeles, 2 vols. (London: Oxford University Press, 1932), 1:195; Bevil, "American Southern Uplands Folksong Melody," 83. 28B. Bronson, "Are the Modes Outmoded?" Yearbook of the International Folk Music Council (1972):24-25. This essay was written in reply to Cazden's criticism of modal terminology and analytical procedures, in "A Simplified Mode Classification." 29The Sacred Harp, 3rd ed., ed. Benjamin Franklin White and E.J. King (Philadelphia: Collins, 1860), 61. 30Bevil, "American Southern Uplands Folksong Melody," 88. I came across but one singer [out of 281 informants] who sang to an instrumental accompaniment, the guitar. . . . Mrs. [Olive] Campbell . . . tells me that . . . singers occasionally play . . . the dulcimer. The dulcimer . . . we saw and heard only in some of the Kentucky mountain schools and never in the homes of the people, where it is evidently but rarely to be found. See K. Reinhard, "On the Problem of Pre-Pentatonic Scales, Particularly the Third-Second Nucleus," Journal of the International Folk Music Council 10 (1958):15-17.